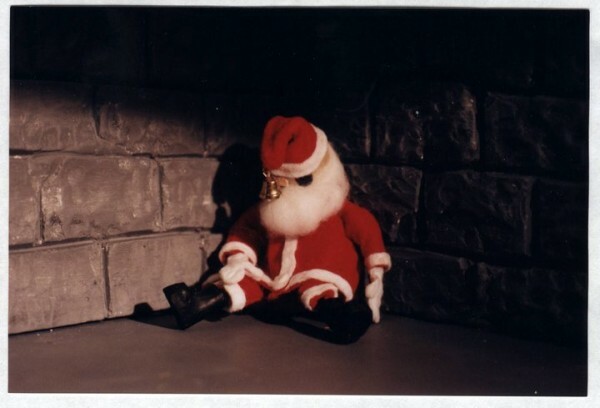 Yesterday, we posted Tinman’s amazing Super Science Friends Christmas special, and today we’re giving you a rarely seen treat: Brian McPhail’s dark cult favourite, Down A Dark Chimney. In the past, our Christmas tradition at Canadian Animation Resources has always been to share the Nelvana cult classic Cosmic Christmas. Last year, we broke from tradition to share this amazing cult film. It was the first time the film had ever been available online, and we’re happy to share it with you again. Produced in Ottawa in 2000, Down A Dark Chimney did the rounds of the festival circuit, and appeared in various short compilations, including CBC’s ZED. I first saw it on the big screen at the Bytowne Theatre in Ottawa, and it blew me away. It’s a crude production, and occasionally almost too dark and muddy to see clearly, but it’s great. Brian captures the charm of the Rankin Bass Christmas classics, albeit reduced to the bare essentials necessitated in homegrown production, and takes the viewer to some surprisingly dark places. The premise is simple, Santa gets shot down over Nazi Germany. Now just watch it. Brian’s been good enough to let me share the film on fundlebundle, a sideproject youtube channel I occasionally run that features a variety of animated shorts. So today we’re wishing you all the best for the holidays with a dreary, bleak tale of seasonal misery. It’s hilarious. This entry was posted on Wednesday, December 21st, 2016 at 9:30 am	and is filed under showcase. You can follow any responses to this entry through the RSS 2.0 feed.